Swami Rajarshi Muni initiated Swamiji in the cadre of monk in 2002, and asked him to serve humankind abroad. Since then Swami Satyanand has been providing his services conducting yoga classes and seminars in yoga studios, as well as teacher training courses throughout the United States, Italy, Canada and Taiwan. In 2010, he secured a beautiful countryside property close to Mebane, North Carolina, and the Lakulish Yoga and Health Retreat (Life Mission USA) was opened shortly thereafter. 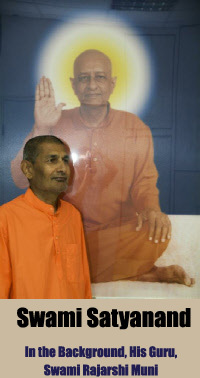 Swami now resides and teaches yoga and gives seminars at his Mebane ashram. In addition to Hatha yoga and Ashtang yoga, Swamiji is knowledgeable in the areas of Ayurveda, diet, shat kriyas, anatomy of yoga, physiology, hygiene, acupressure therapy, yoga therapy, psychology, and Sanskrit. He is familiar with at least 600 asanas and various pranayamas. In the winters, Swami Satyanand teaches several courses at Lakulish Yoga University in Ahmedabad, India, the first government accredited yoga university in the world. He continues his mission to spread the knowledge of sanatan dharm throughout the world, thus improving the lives of everyone who is searching for truth. 1 Sannyasi is a Hindu religious monk or mendicant who has renounced worldly life.